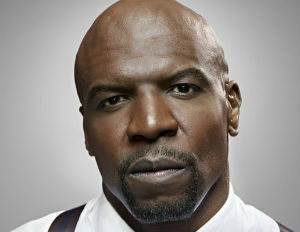 Terry Crews may be known as Damon, the shirtless, greased up ex-convict from Friday After Next or Latrell Spencer, the narcissistic football player obsessed with, well, White Chicks, but before Crews can be cast as the six-foot two-inch go-to black man with a six pack he has to make sure he’s in shape for the part. There’s no question the Flint, Michigan native is toned and fit, but it’s taken years to get there. Crews began his non-stop training in high school, which landed him an athletic scholarship to Western Michigan University. It became inevitable that the NFL would draft the young defensive end, and now the 245-pound athlete-turned-actor is proud to show off his weight room and field training by strutting his stuff on big screens around the world. Happy to highlight the importance of a healthy body and the work it takes to get there, Terry Crews told BlackEnterprise.com his lifelong dietary and workout secrets and what it takes to land a real woman when everyone is trying to get a piece of the pie. According to Crews, it’s not just milk that does a body good. Black Enterprise: You’ve kept a pretty toned body and healthy body for years. How do you keep it up? Terry Crews: I run everyday–all the help is in the running. I run about four miles a day and I lift weights about four times a week, [and] I get every body part. A good workout takes about two hours for me, but I’ve worked my way up to that. I’ve been working out for 30 years. I developed systems that work for me over the years. A lot of people can’t trust [themselves]. I don’t’ trust Terry Crews. Terry Crews is just going to do what he is going to do and all of a sudden [he’s] going to mess up–not going to workout, not going to eat right or whatever. So what I do is I plan out when I’m going to workout, I plan out what I’m going to eat and I stick to it. You got to plan it. If you don’t plan it you’re going to just go off. Black Enterprise: What do you tell people who want to tone up but don’t know where to start? TC: I would never tell anybody to go in the gym and kill themselves ’cause if you come out too sore, you’re not going to [go] back. I tell people start out with one [mile]; start out with a half a mile; start out with just 20 minutes, and plan that 20 minutes. And sooner or later–and I mean in a few years–you’re like, ‘Man, I’m working out for an hour and a half.’ And it feels like nothing. You’ll be shocked. Black Enterprise: Are you restrictive with your diet? TC: I don’t eliminate anything from my diet. I write down everything I eat twice a year for 30 days. What happens is you get a really good view of what you’re actually eating…and you find out you’ve been snacking all day, and you got like 2000 — 4000 calories that are unaccounted for. You think you’re eating good, [but] you get a real good picture of what you’re eating for real. You think, ‘Oh, I had a chicken breast.’ Yea, but you had a Big Mac on the way to that chicken breast. So once I get that picture, it really makes things clear. Once I have a good diet together — I’ve seen it, and I’ve eliminated the bad stuff — I try and eat the same things all the time. Lots of veggies, lots of lean meats, I do a lot of grilling for the week and then eat on it all week. And then I do have desert. Black Enterprise: As a married man, how do you handle the attention you receive from women as you walk down the street? Black Enterprise: How did you become more than the guy someone saw on the street? TC: What happens is, being married for 24 years, my wife has made me into the man that I am. My wife knows everything about me, and let me tell you something, there’s nothing better than having somebody that knows everything about you and still loves you. That wakes you up in the morning, makes you sing and makes you say, I got a good life. Most people are just frontin’. That whole, you go to the club [thing, but] everybody’s putting on a picture [is overrated]. Nobody knows who these people are. And that’s the thing, and it’s scary. But I got somebody who knows [me]! The trick isn’t going from woman to woman; the trick is convincing one woman who knows all your sh*t to still love you–that’s the trick of the century. There are a lot of women that say, ‘That’s enough. I found out too much. Gotta go.’ But when you got that [one], [there] ain’t no complaints at all. Ms. Rebecca Crews is my queen.